Coffee production in Costa Rica employs up to 150,000 people, representing 8% of the Costa Rican workforce, and accounts for nearly 10% of national greenhouse gas (GHG) emissions. In order to reach the national goal of carbon neutrality by 2021 and contribute to international climate protection measures, the first agricultural Nationally Appropriate Mitigation Action (NAMA) was developed by the country. The NAMA Support Project (NSP), “Low-emission coffee NAMA Costa Rica” (NAMA-Café) collaborates with the main actors in the coffee value chain in Costa Rica and uses closely integrated technical and financial cooperation instruments. Greenhouse gas emissions will be decreased through practices such as efficient fertilizer use and use of shade trees, these practices will be scaled up using capacity building measures and financial incentives. The NSP will further increase economic sustainability of coffee production by facilitating access to differentiated markets. This close collaboration with cooperatives and mills, in addition to multipliers like the national extension services, and the regulated financial sector, will contribute to a transformation of Costa Rica’s coffee sector. Projected emission reductions are about 120,000 tonnes CO2/year. Research by scientists at the International Center for Tropical Agriculture (CIAT) helped secure the funding for the Costa Rican coffee NAMA. The NAMA proposal partly leverages on impact assessments and mitigation options for coffee systems that CIAT shared with the Ministry of Agriculture and Livestock (MAG), the Gesellschaft fuer Internationale Zusammenarbeit (GIZ), the Instituto de Café de Costa Rica (ICAFE) and the NAMA facility review mission. CIAT also trained MAG employees on these results, which were used as background information for the NAMA. CCAFS. 2016. 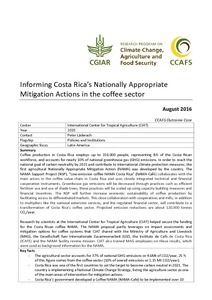 Informing Costa Rica’s Nationally Appropriate Mitigation Actions in the coffee sector. CCAFS Outcome Case. Copenhagen, Denmark: CGIAR Research Program on Climate Change, Agriculture and Food Security (CCAFS).